I read Carson McCullers’ The Ballad of the Sad Café and loved her lyrical prose. Her writing is deceptively simple and has a laid-back, soothing quality — perfect for a vacation. 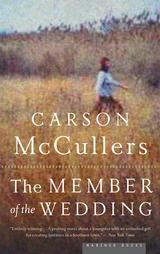 The Member of the Wedding has many of the wonderful qualities that McCullers is known for, but it feels a little loose and repetitive. You could argue the repetition emphasizes and describes the protagonist’s boredom, but the pace drags even at a scant 163 pages. That said, Frankie’s dialogue and ludicrous scheme are simultaneously funny and touching. McCullers strikes a strange balance with such a character; Frankie carries the novel when the plot and supporting characters weaken. […] Carson McCullers’ classic The Member of the Wedding tells the story of the inimitable twelve-year-old Frankie, who is utterly, hopelessly bored with life until she hears about her older brother’s upcoming marriage. Bolstered by lively conversations with the family maid, Berenice, and her six-year-old male cousin – not to mention her own unbridled imagination – Frankie takes an overly active role in the wedding. She hopes even to go, uninvited, on the honeymoon, so deep is her desire to become part of something larger, more accepting, than herself. Once Frankie decides to join the we of her brother and his bride, she takes the name F. Jasmine and refers to her pre-epiphany self as the “old Frankie”. Her insistence to separate herself from the person she was only weeks prior is endearing. She believes this single epiphany will snap her into adulthood, into the person she is meant to be. What adolescent doesn’t feel this way when deciding something important? As F. Jasmine becomes more focused, so does McCullers’ writing. It’s F. Jasmine’s imagination and her conversations with Berenice that hook the reader. Though F. Jasmine believes she will start anew with her brother and his wife, everyone (including the reader) knows better. Even though I understood this, the end still had a few surprises. This is a sad book in many ways, but worthwhile. It’s slow-moving, but it does have moments of emotional payoff. Overall: 3.8. McCullers’ other novels are written more cleanly with a better eye for detail. I expected more from her. (Is this fair?) I’ve heard this book is also a play; since the dialogue is the strongest aspect of the book, I think it would work well as such. Translation: It’s a nice afternoon read.